He had a bit part in Armageddon movie as Quincy "the smartest man on the planet". Was rewatching it and just recognized him! He has a tv series starting some time this year, on NBC I believe where he plays a cop(? )detective who is in a car accident. When he wakes up, in one reality, only his son survives the accident, in another reality, only his wife survives the accident. He wakens in one یا the other reality and as he works to solve cases, he must figure out which reality is the real one. It sounds really good and I can't wait for it to come out this year. The فلمیں I have seen that Jason is in a good role so far are. The State Within, Case Histories, also possibly Capital City. These are all mini series from the bbc and I believe دوستوں with Money he is a writer that leaves his wife, not really a bad guy but bored husband. Awake is the best bet to see him play a good guy. In "Peter Pan" he didn't only play Hook, he played Mr. Darling, who is a good guy in the end. His character in "Harry Potter", Lucius Malfoy, turns into a good guy at the end, too. 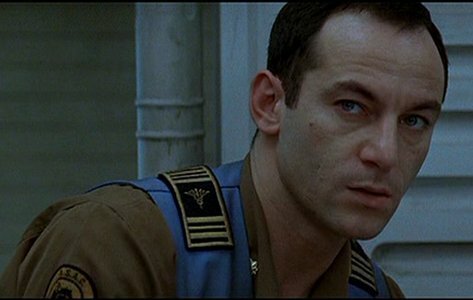 He was one of the crewmembers on the Event Horizon (film:Event Horizon) he's not the good guy سے طرف کی saving the دن but he wasn't the enemy in the film. His character is a victim of the events and, in general, likeable. Black Hawk Down. He is Capt. Steele.